The software (which is a part of software-hardware encryption complex Stealthphone Hard) allows you to send encrypted text and files via any common communication software - Skype, Facebook, Google Talk, ICQ or via e-mail. Only the intended recipient (Stealthphone network subscriber) will be able to decrypt your message. To encrypt text and files you need to connect hardware encryption device Stealthphone Hard to your PC via USB. You also need to install CryptoFile on your PC. Most CEOs who work in financial, legal, medical companies or in private detective agencies often need to exchange (via insecure channels) sensitive documents with partners, clients or employees who work outside the office. The encryption key is stored in the hardware encryption device and is never transmitted anywhere. All the encryption runs outside your PC, so the criminal won’t be able to access encrypted data even with the help of malware. You don’t have to install CryptoFile - just run the software on your PC. 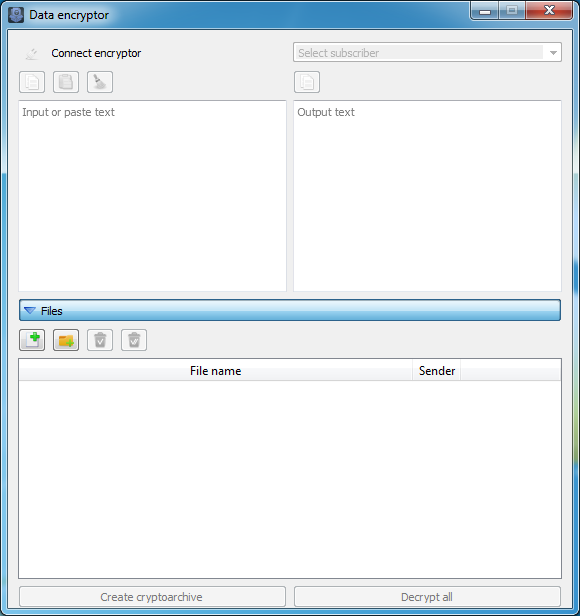 CryptoFile is compatible with Apple Mac OS, Microsoft Windows, and Ubuntu Linux. CryptoFile interface supports Russian and English languages. Every computer, connected to the Internet, is vulnerable to malware and spyware. That’s why we recommend you to use PC which is isolated from the network when you want to create and encrypt particularly sensitive documents. After encryption you need to save files to the external memory card. You can connect this memory card to another computer and send files via common communication software. This will help you to secure your sensitive files against theft or tampering.